Once things are stowed you can’t get to anything until you reach your destination (unless you want to squeeze your way through). So I had to prepare several snack bags for everyone in the car. Triple check everything! For an RV to work it needs to be plugged and hooked up to lots of things. Damon got in the car and almost drove off before he saw that the power was still hooked up. Then he forgot that the propane was still on. Lesson learned – do several walk arounds before leaving. Not too bad for beginner, especially with two young children to care for as well. Hopefully we’ll get faster as we progress. 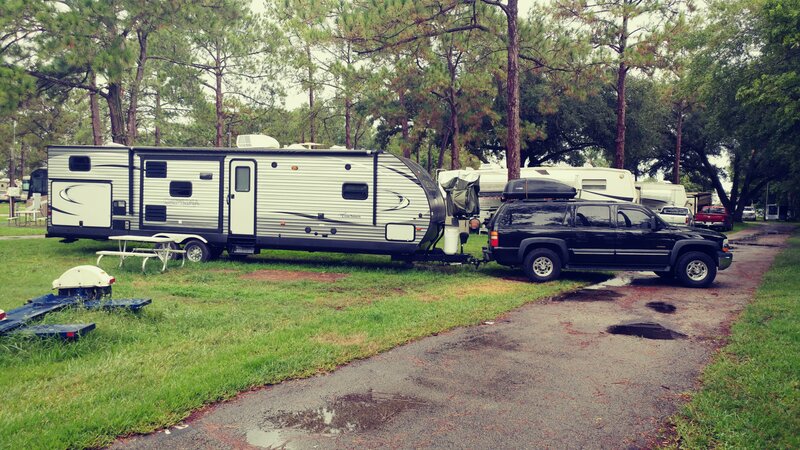 For now, we are thrilled to be on the road, heading to Fort de Soto, Florida.